District Judge Court, Hooghly, West Bengal has released notification for Hooghly District Court Recruitment 2017 for various vacancies like LDC, Stenographer, English Typist-Copyist, Process Server, and Peon. Candidates who are eligible and interested can apply for Hooghly District Court LDC Recruitment 2017. Here we will provide complete details regarding Hooghly District Court Notification 2017 in the following sessions. Also, check eligibility criteria like age limit, educational qualifications, Pay scale for Hooghly District Court Recruitment 2017. The complete Hooghly District Court Vacancy list have mentioned in the above table. So, here we advise candidates to check Hooghly District Court LDC Recruitment 2017 before applying for Hooghly District Court LDC, Typist, Steno vacancies. The complete details of Hooghly District Court LDC Recruitment 2017 have mentioned in the above table. The Important dates for Hooghly District Court Stenographer Recruitment 2017 have mentioned in the above table. candidates can also check Hooghly District Court syllabus and Hoogly District Court previous Papers by clicking on the links provided below. Hooghly District Court LDC Recruitment age limit is as follows. Minimum Age Limit for Hooghly District Court Stenographer Vacancies is 18 years as on 01st January 2017. Maximum Age limit for Hooghly District Court Vacancy 2017 is 40 years as on 01st January 2017. 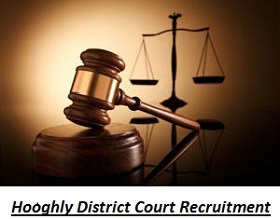 For Hooghly District Court LDC Recruitment candidates must possess Higher Secondary Education and Diploma/Certificate in Stenography, and also have knowledge in Computer and Printing operation. The selection process for Hooghly District Court Stenographer Recruitment is as follows. Hooghly District Court LDC, Typist, Steno salary are as follows. For Hooghly District Court Stenographer Vacancy salary is between Rs.7100/ to Rs.37, 600/- plus Grade Pay Rs.3900/-. Hooghly District Court Lower Division Clerk Pay Scale is between Rs.5,400/ to Rs.25,200/- plus Grade Pay Rs.2600/-. For Hooghly District Court English Typist- Copyist Job pay scale is between Rs. 5400/- to Rs. 25,200/- plus Grade Pay Rs. 2600/-. Hooghly District Court Process Server Vacancy salaries are between Rs. 5400/ to Rs. 25,200/- plus Grade Pay Rs. 2300/-. For Hooghly District Court Peon Recruitment Pay scale is between Rs.4,900/ to Rs.16,200/- plus Grade Pay Rs.1700/-. Search for Hooghly District Court LDC Recruitment 2017 link. Read the Hooghly District Court Stenographer Recruitment Notification 2017 clearly. Now, apply for Hooghly District Court LDC, Typist, Steno Recruitment online. Fill the Hooghly District Court Application form with correct details. Check the details and finally submit Hooghly District Court LDC Application form. Take a hard copy of Hooghly District Court Stenographer Application form for the future purpose. Book Mark our website Recruitment Hunt regularly for more latest updates regarding all other Latest Govt jobs in West Bengal. Aspirants can also download Solved previous Papers PDF and syllabus of All Govt Jobs in West Bengal.